The sculpture of this tiny angel of the city can be found on one of the benches in the Izmailovsky garden. 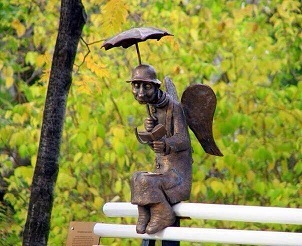 Intelligent angel with umbrella appeared in St. Petersburg thanks to Roman Shustov. 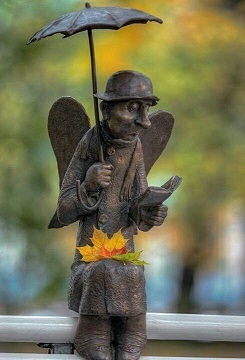 According to this talented sculptor, this little statue is the personification of the unique generation of the Leningrad old people who lived over all the hardships and horrors of war, blockade and Stalin's repressions and miraculously did not lose the warmth. Of course, this amazing generation is gradually disappearing, but cute Roman Shustov's angel continues to give all of strolling through the garden a little piece of warmth. In addition, each of us can sit on a bench and to keep him company.